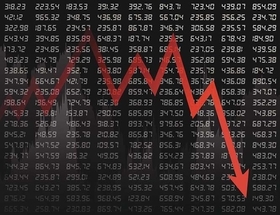 Stocks of investor-owned health systems and health insurance carriers took a significant hit Monday, swept down by the broader tailspin that hit the Dow Jones industrial average and the S&P 500, both of which fell by more than 4%. HCA Healthcare was down 3.81% as of market close Monday, even bigger than the 2.49% drop the Nashville-based hospital chain experienced at the end of last week. Community Health Systems fell by 3.49%--steep, but not quite as much as the 4.56% hit it took on Friday. Dallas-based Tenet Healthcare Corp.'s stock prices fell by 3.56% Monday, slightly less than the 4% drop the system saw on Friday as tensions persist with its largest shareholder, Glenview Capital Management. Insurers felt the effects, too. UnitedHealth Group plummeted by 5.11% Monday. Cigna was down nearly 4%. Humana was down 3.4%. Aetna dropped 2.19%. With the S&P off by as much as it was on Monday, analysts expect to see a corollary drop in healthcare stock prices, said Michael Waterhouse, a healthcare analyst with Morningstar. "It seems to be hitting the market with a pretty broad-based sell-off," he said. Morningstar classifies HCA, Tenet and UnitedHealth stocks as overvalued, Waterhouse said, which makes a sell-off of those stocks less surprising. That said, he added, "the degree of the sell-off has been a bit unexpected, in my personal view." Waterhouse cautioned against reading too much into why one healthcare company's shares dropped more than another's, as there are many people in the market selling and buying for a multitude of reasons.